This Monster stun gun with flashlight allows you to shine the ultra bright flashlight and power the high voltage stun gun in a single-hand operation. Built to last through years of use it can withstand the daily abuse a flashlight must endure. 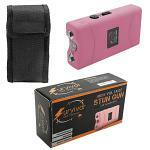 Nylon carrying case is included; simply strap this handy stun gun to your belt so you have it anywhere, anytime. Small build, big bite the stun gun encompasses the volt trashing power of a stun gun while providing the daily practicality of a flashlight. Looking for more protection? You might also want a Matching Pepper Spray! Overall dimensions: 4.25" x 2.13" x 1"
(L x W x H) 4.50" x 2.50" x 1.50"